To celebrate my first scheduled job interview after almost five months of being laid off, I decided to treat myself to a new outfit and lunch at Panera Bread. Little did I know the job interview would be cancelled rescheduled cancelled rescheduled, and unless I wanted to wear a large, flowered mumu, I didn't find anything worth buying. Oh well, at least I had a good lunch. Since I was in the area, I stopped into the Seekonk, MA, location at just around 3:30 p.m. Mom sat this one out, but later complained that I didn't bring her a sandwich - even though she never asked for one. As I paid for my meal, Toby took my name and asked me if I knew where I was to pick up my order. I was pretty sure I knew where to go, but she verified that I was to stand by the sandwich counter to get my sandwich, and the front counter to get my beverage. She then handed me a receipt and sent me on my way. A very efficient system, I must say! 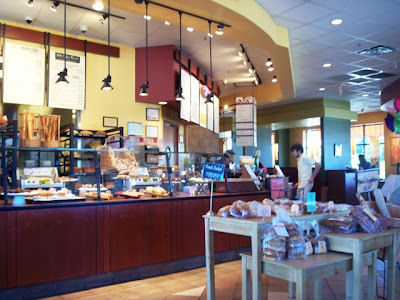 Panera Bread is not your average sandwich shop. It's quite the trendy place to hang. Panera has Wi-Fi, so that should prepare you for seeing a lot of people working on their laptops while chowing down on something good. There is a lot of comfortable seating like couches and overstuffed chairs (besides the normal booths and tables) all scattered around a large fireplace. I often picture people sitting around on the furniture, talking about themselves and reading poetry. Panera Bread seems to cater to the college crowd and snobbish career folk who wouldn't be caught dead sitting in a McDonald's parking lot with a Big Mac. For example, when I tell fellow Big-Mac-in-the-car-fans that I went to Panera for lunch, they say, "Oooh, big spender!" I feel like I went up a notch in status. Who knew that eating lunch here could make you feel so important? After hearing my name being called, I took my food-to-go and headed for the parking lot. As I was getting all settled with my sandwich and drink in the car, I kicked myself for not thinking about eating outside on the patio. It probably would have been a lot easier to eat. Oh well, I had everything set up on the passenger seat, so I wasn't about to get out now. 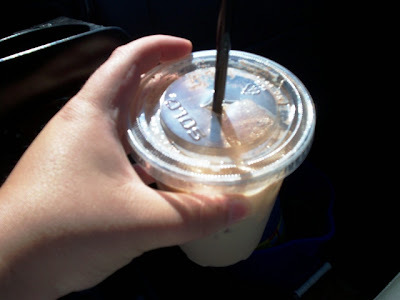 Just as I expected, my iced chai tea latte was amazing. It had a strong chai flavor and the nutmeg and cinnamon sitting on top gave it an extra burst of spice. The Panera brand potato chips were OK, although they reminded me very much of Cape Cod chips, which I'm not really a fan of. I find them too crunchy and greasy, but for the time being, they went really well with the delicious sandwich. Stuffed with thick slices of lean, oven-roasted roast beef, smoked cheddar, lettuce, tomato, red onion, and horseradish sauce, this sandwich - which is one of Panera's signatures - was both tangy and hearty. Although the rustic Asiago cheese demi was a little tough to bite into, the taste was excellent. All of the flavors really went well together, and the surprising standout of the group was the red onion. It really spiced up the taste. I couldn't help thinking of my friend Scott, who adores red onion. I'm pretty sure he would have enjoyed this sandwich. All in all, it was a great lunch and I'm very glad that I didn't just go through a drive-thru to get something to eat. I stopped, got out of the car (which seems to be a big issue for a lot of people, myself included), and picked up an awesome sandwich made with fresh ingredients for almost the same price as one of those tacky value meals. Speaking of price, depending on what you get, Panera can be a bit expensive. For some reason, the coffee drinks are priced much higher than what you would find at Dunkin Donuts or Tim Hortons. However, they're really good, and if you want to spend a little extra, you certainly won't be disappointed. One of the best things about Panera Bread is - drumroll, please - the bread! All of the breads are freshly baked, and the bagels are some of the tastiest around. My favorite combination is the Asiago bagel with vegetable cream cheese, while Mom likes the French toast bagel with honey walnut cream cheese. Trust me, they're delicious. Specialty breads include the cinnamon raisin, honey wheat, tomato basil, sourdough, and Asiago cheese. I also remember a Kalamata olive bread that was really good. They also have a small selection of pastries like cookies, brownies, muffin tops ("muffies"), sweet rolls, and mini bundt cakes with sweet icing. If you're looking for something heartier for breakfast, try their egg sandwiches with bacon, sausage, and other combinations. They also serve baked egg souffles and strawberry granola parfaits. For lunch and dinner, try one of their signature sandwiches, salads, or soups of the day. Panera Bread definitely caters to picky and healthy eaters because of their large selection of foods with high nutritional value. Panera Bread also does catering, and I'm sure you'd be the office hero if you were to walk into a conference room with a bag full of Panera bagels. Try it! I'm sure you'll get a raise. Hey, that gives me an idea. Perhaps I should bring some on my interview for good measure ... when and if it happens. Keep your fingers crossed! 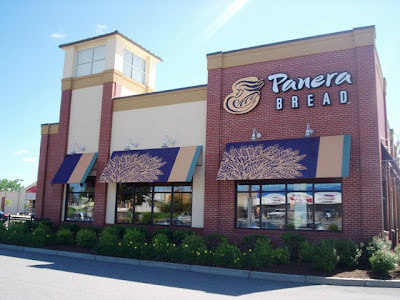 The Panera Bread in Seekonk is located at 211 Highland Avenue. 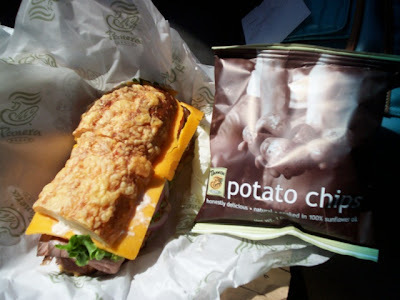 For more information, call (508) 336-1401 or visit the Web site at www.panerabread.com.